Collect $1 in ‘Bonus Bucks’ for every $10 you spend. Save with Deep Roots Bonus Bucks! 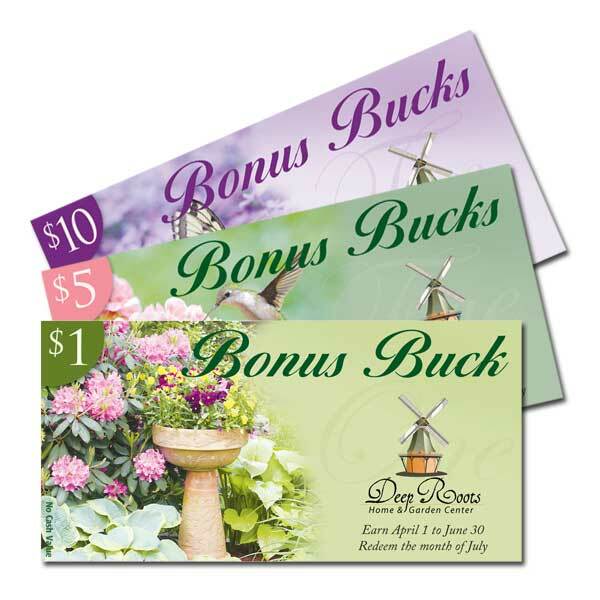 Our Deep Roots Bonus Bucks are our way of thanking you for your business. You can earn bucks from April 1st to June 30th. You’ll earn one ‘buck’ for every $10 you spend. You can redeem your bucks for up to 50% of your total purchase (some restrictions apply) in the month of July. See store for details. Cannot be combined with any other offer. Not responsible for lost bucks.